Model number ADM-3A Printed in black ink on the left end of the metallic label attached to the back of the unit. Model number TV 12 LSI Stamped on a silver label, on which "Ball Brothers Research Corporation" is printed, attached to the CRT inside the unit. Other number 7-0122-0216 Stamped on a silver label, on which "Ball Brothers Research Corporation" is printed, attached to the CRT inside the unit. Part number 129450 Printed in silver ink on the lower left side of the metallic label attached to the back of the unit. Serial number 177B695 Stamped on a silver label, on which "Ball Brothers Research Corporation" is printed, attached to the CRT inside the unit. Serial number K2071 Stamped on the left end of the metallic label attached to the back of the unit. 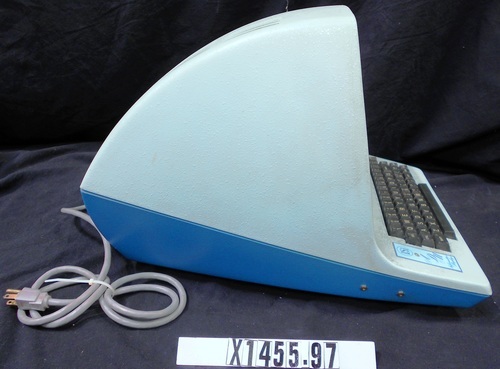 This is a typical serial terminal with an 11-inch diagonal display encased by a heavy metal two part hinged enclosure. The top part of the enclosure is green and has eight columns of screened vent holes on the top and cutouts for the keyboard and brightness control on the lower panel at the front. To the left of the keyboard, held in place by a single screw, there is a printed blue label with the manufactures name. The lower half of the enclosure is blue and has two toggle switches on the left side toward the front; the toggle handles are broken off. On a recessed panel on the back of the lower part of the case, just below the hinges, there are two 25-pin D connectors, labeled 'MODEM' and "EXTENSION,' from left to right. The power cord emerges from an indent on the lower left side of the lower case, and the ON-OFF switch is located horizontally above the cord. The fuse holder emerges from the upper left corner of the bottom of the blue section. There are also two rows of ventilation ports protected by filters cut into the bottom, and a small speaker on the upper right side of the bottom pokes out from a small protective enclosure. The CRT, high-voltage supply, and sync circuits are all located in the top section of the hinged enclosure. The bottom part of the enclosure supports a circuit board measuring 18 in by 13 in, which in turn supports the keyboard and 144 mostly 14- and 16-pin SSI packages. Five power transistors mounted on heat sinks line the left and right edges of the circuit board. Three DIP switches mounted with a label plate for setting baud rate, parity, etc. is located to the left of the keyboard beneath the removable manufacturer's plate; these could be made accessible without opening the case (but on this object that plate is in place). Two more DIP switches are located near the back of the PCB for selecting less-common settings for the display. The multi-secondary power transformer is attached to the bottom of the lower case below the circuit board, which is not held in place by any fasteners.